This week was a bittersweet 72% cocoa dark chocolate. Yesterday marks Ollie’s last day. I am very proud that she’s a certified Divemaster and super thankful I’ve met a wonderful crazy friend. For the past three weeks, she cheered me on, encouraged me and attacked me. As mentioned in previous posts, my stamina components needs work, lots of work. Ollie gave me tips and exercise workouts to improve my physical health. Through muscle aches and lots of exercise, I saw myself improve my timings and stamina. We also helped each other with our individual reef-mapping. For my rescue diver scenario exercises, Ollie was my panic diver, unconscious and unresponsive diver. She is a top-notch actress, tearing my mask and made me drink sea water countless of times. Granted, I made her guzzle salt water when she was my unresponsive diver. I am definitely going to miss diving and having good times with her, and wishing her the best in her diving career. On the bright-side, I had my first bubble maker and I’m on my way to become a PADI Divemaster real soon! Passing my Rescue Diver and working on my 800m snorkel with the team everyday, passing the course is just a matter of time, and not an impossibility. I’ve been waiting for this moment since the start of my internship, I’m finally a DIVEMASTER! The feeling I had when we finished off the last assessment was so incredible! A lot of hard work has finally paid off. The path to Instructor suddenly doesn’t feel that long! We started off the week doing Starfish’s Rescue Diver. I had so much fun being the tired, panicked and unresponsive diver. Starfish really got the feeling of being in a serious situation when I grabbed her mask and tried to climb her as a panicked diver. The same day I finished off my Search and Recovery and Rescue Assessment. It feels very good every time I tick off something from the “will I soon be a Divemaster”-list. 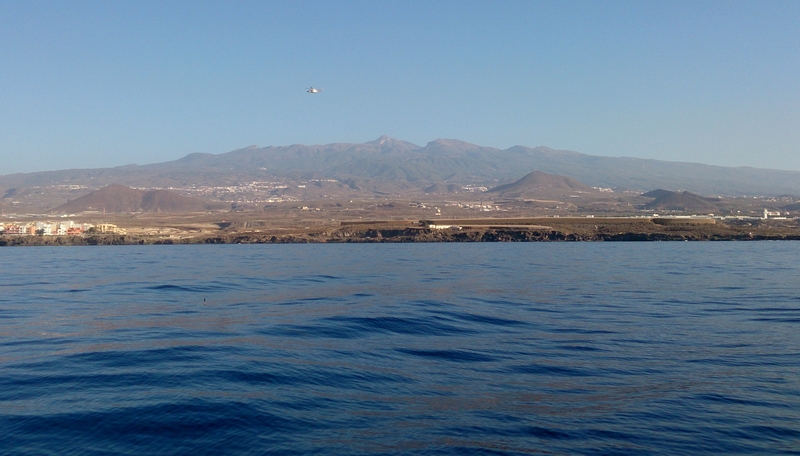 Tuesday we headed off to Alcalà, which is one of my favorite dive sites here in Tenerife. We always see turtles here. Not only one or two, but three! They are so friendly and curious. 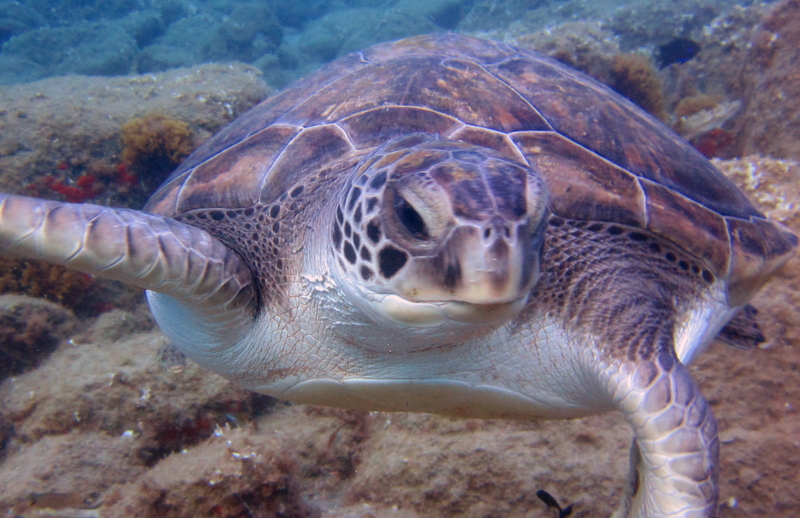 We had 3 certified divers with us Lynn, Paul and Nick so we all enjoyed our recreational dives looking at beautiful rock formations, fish and turtles! The next day we were ready to drive off to Abades. Starfish and I were going to map Abades to draw an understandable map with bearings, depths and kick cycles. We were really happy about the result and in the end of our dive we saw a HUGE octopus out in the open chilling at the reef. I was ecstatic! Thursday we started the day in the pool with DSD’s. Two kids, and their dad from France. This was the first time I heard Randall bringing his entire dive lingo out in French! Even if I didn’t get a single word he was saying I enjoyed both the confines and the Open Water Experience. As Randall and myself were going with the DSD’s and the mom, which is certified, Flounder went off with Lynn and Paul for the last dive here with us in Tenerife this time. When we came back I did my Divemaster exam… and damdamdaaa… I passed! Friday, THE day! First we went straight down to the pool to tick off the last skills I needed to do in the pool. While I was swimming my 400m, Flounder and Starfish practiced skills! The next step was to bundle up the kit, go down to the Marina (other side, open water) we decided to go a little crazy and do my Deep Assessment in a very wavy condition. Randall, Flounder and I had a proper workout swimming out and descended next to the Marina Wall. It was a lot of surge, so we swam hard for 10 minutes before we hit the 18m depth mark. Did one necessary skill and headed back, then with the current. Felt very good when our legs were all like jelly. So I finished off my Divemaster almost rolling up on the beach in the waves! The last day of the week we had two DSD’s Ting and Rory from England. 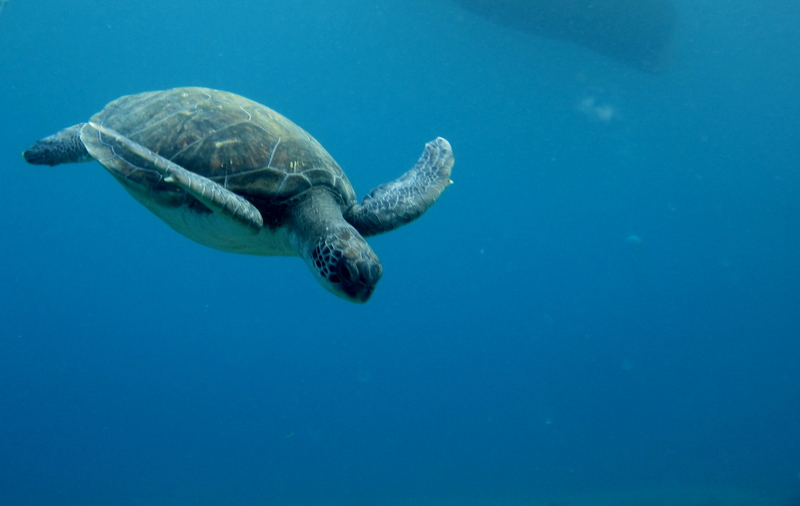 We had a nice pool session before we headed off to Alcalà to see my favourite turtles once again! Next week is my last, eight week. 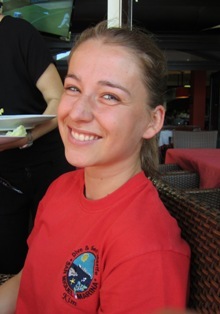 And my very good friend Malin is going to join us to do her PADI Open Water course. It’s going to be an awesome week! I am so close only a few more items to complete and I will be a Divemaster!!! This week has been a bit different with mostly administrative work and finally completing my PADI Divemaster Manual now studying towards my Divemaster exams. We started off the week in the pool to go through the 24 skills you need to learn to complete your Divemaster. It’s so much fun to see how much my skills have improved since we started. Now I just have to look forward to the Divemaster marked Skill session. Stamina exercises has been a task this week as well. I finished off my 100 Meter tow and 800 meter snorkel at both 4 points out of 5! I Couldn’t be happier! 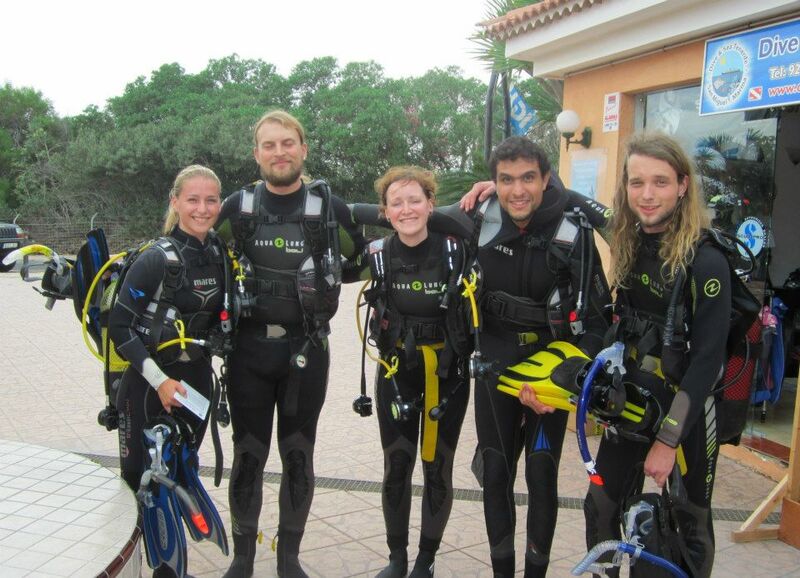 We had two beautiful dives at Abades with Katie, Ian and Heather . The visibility, air consumption and weather was impeccable! Before we headed off for Abades we tried El Puertito and Alcalà, but both places had bad conditions. Better safe then sorry! Two more weeks to go, and my Divemaster certification is breathing me in the neck! 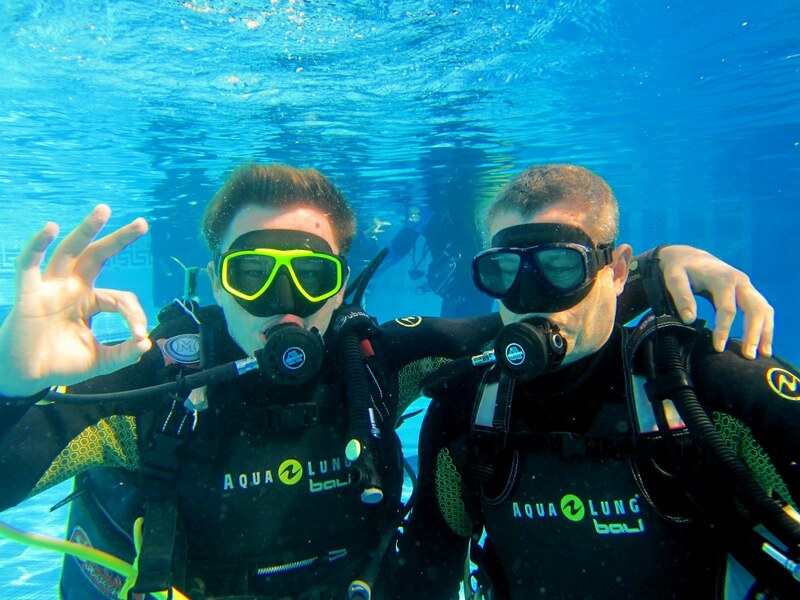 PADI Open Water and Advanced Courses…….. This week has been hot and sunny in Tenerife! 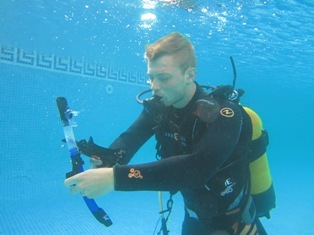 Lewis decided to continue his diving education and we went to Alcalà to do his Navigation and Peak Performance Buoyancy. As always he did a good job and we enjoyed looking at the two turtles that lives there. Both very curious! Alcalà is such a good dive site with deep water entry and cool rock formations with vibrant aquatic life! Thursday we were supposed to go for a night dive at Tabaiba, but after a couple of Lewis’s Advanced Dives we realized that it was too much of a surge to dive. We drove over to Abades to see if the conditions were better, but unfortunately to choppy waters there as well. Either way it was a fun road trip, singing in the car and Alan and I had a dance session in the car park. I can officially check off all the requirements needed to become a PADI certified Divemaster! I had the pleasure to complete my 60th dive at one of my favorite sites, Abades, where we took our young PADI open water student Lewis. I have to say, it was a rewarding feeling to see Lewis complete his open water course, because just two weeks prior we were taking him on his first ever dive as a Discover Scuba Diving participant. It was a very gratifying moment to see a customer start with no idea what to expect when it comes to recreational diving, and then to watch them transform and fall in love with the sport. This week also concluded the FIFA World Cup Finals. Being one of the few Americans to enjoy watching the event back home, it was really neat to witness the event abroad. After work, all the interns met up at a bar in the local town of San Blas to watch the showdown. The atmosphere was unlike any I have experienced previously when it comes to watching football. The only disappointment was watching Argentina lose. It’s a bittersweet time for me right now to only have one week left for my internship. I know I will be happy when I am back home, but at the same time it is hard not to miss such a beautiful place and all the great people I will have to leave behind. So for now, I plan to make the most out of these last days and bring home some awesome memories of working here in Tenerife with Dive and Sea Tenerife! 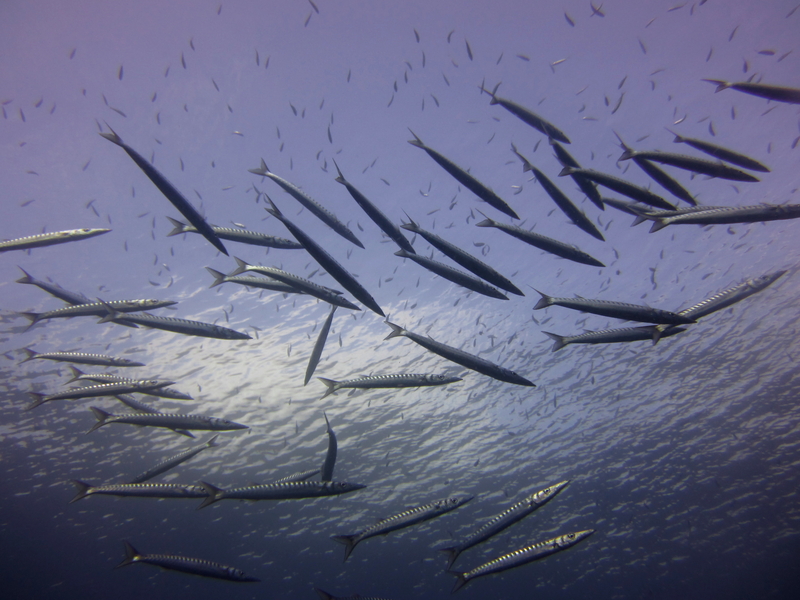 Alright so Alan’s blog week number six at the wonderful dive shop, here on the beautiful island of Tenerife. So this week diving wise has been the week of el puertito. We started off the week on monday diving with Patrick and James on their last dive with us, for now at least. Randall did a great job leading the first dive, and then he gave me the task of leading the second! I feel so much more confident with it all, like the dive briefing and the underwater navigation. Later on in the week we went back to el puertito with an open water diver who’s name was Fabio. He’s from Italy and only had a few dives under his belt but was still good. The first dive was the best dive that I’ve had at the site. We had a turtle follow us for a half hour and wouldn’t leave us alone, it was a great opportunity for pictures! Friday we went to the boat. It was sad seeing it out of the water and with one of its sides deflated but we where able to clean the underside of it and get it just a little closer to going back into the water. The rest of the week was full of administration work, which is good to get that kind of experience of the dive industry. I ended the week with 57 dives and I need 60 to be a Divemaster! Ahhh I’m soooo close!! I can’t wait to be a PADI professional, it has been a dream of mine for quite some time. Bring on week number 7!! Finally, I feel like I know where everything is and the routines in the shop. This week has been a bit different from the first one. I’ve learned so much from Patrick! He is such a good instructor and a very nice guy. Hopefully I get to dive with him again one day! We did a very exciting dive at Alcalà! We had never been exploring this particular dive site before, so we had heaps of fun looking at a nice reef and two turtles. I tried to do my swim (400m) in the pool. But I think karma decided I was not going to do it that day.First the goggles didn’t work properly so my contacts fell out, and second my towel flew in the pool and got soaked! Sunday we had a productive day! I was observing Randall and Flounder doing confined skills with Louis who is going to do his PADI Open Water certification with us. He did so well and it’s going to be a thrill being a part of his open water dives too! After the pool session, Flounder and I did some skills I need to know for my PADI Divemaster. Finally I feel like my skills are improving! We finished off the week by learning knots from Randall in the sun. So nice to be able to work outside! It’s all been a good week and I’m very excited for the next one to start! Hopefully you are all enjoying reading our monthly newsletter, if there is anything you would like added to our newsletter please don’t hesitate to contact us. March has been yet another busy month, and I hope you are all looking forward to your Easter break. We already have a fun filled fortnight ahead of us, we look forward to meeting new divers and welcoming back familiar faces. 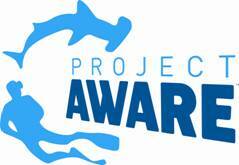 For future Project Aware activities that are planned please keep an eye out on the website, Intern blog, facebook or the monthly newsletters. 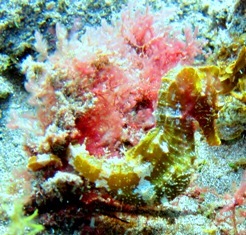 Exciting news this month, Melissa saw her first ever Seahorse at El Puertito. Seahorses are a rare commodity here in Tenerife, so Melissa and Sara and James were delighted with their find and spent a good few minutes watching the little Seahorse sway around in the sea taking as many photographs as possible as evidence that they did see the Seahorse! Congratulations to Kim (Alice) for passing her Divemaster Course. Kim has decided to stay on for an additional 5 weeks to gain more practical experience as a divemaster. Kim has been helping new interns George and Chris settle into life at the dive centre. George (Zippy) who is just 18 has joined us as a PADI Advanced diver and has joined us for the internship for 8 weeks before heading off to study accountancy at university in September. George has already completed his EFR and Rescue course as well as training hard for his stamina assessments. 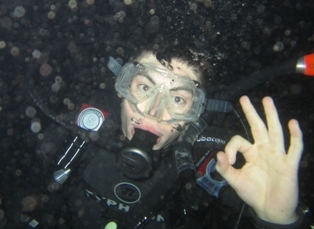 Chris (Bungle) 24, joined us as a PADI Open Water diver and is here with us for 8 weeks. Chris has been travelling around Australia and Asia and would like to gain employment within the dive industry before carrying on his training to become an PADI Diving instructor. 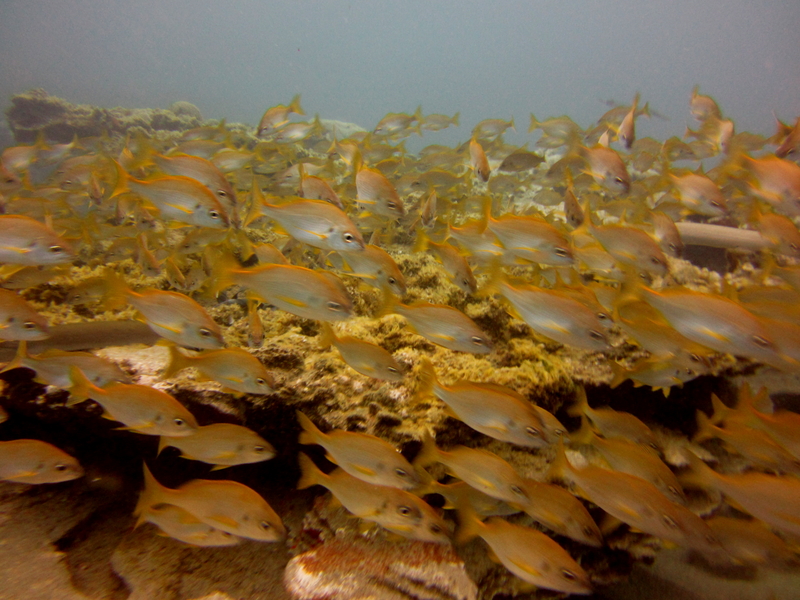 Gijarro Arrecife is one of our newest dive sites. 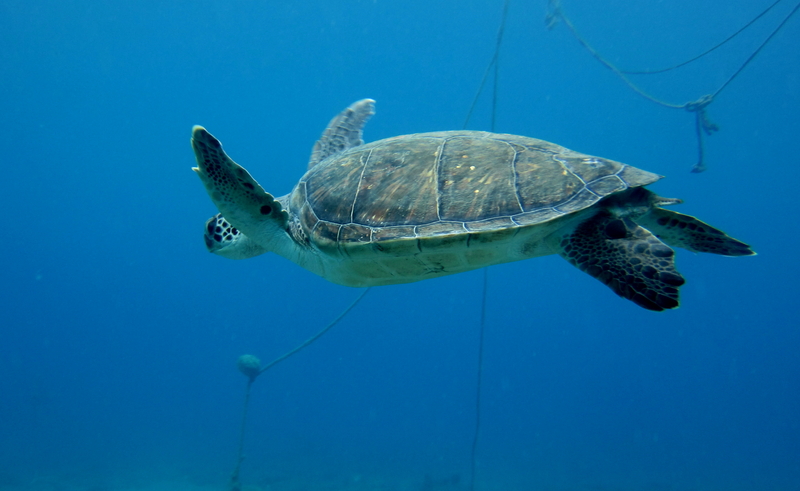 This is a boat dive located approximately 10 minutes away from San Miguel Marina. We enter the water in 4 – 5 meters of water and descend. With a maximum depth of just under 12 meters it is ideal for divers having completed the PADI Discover Scuba Diving experience, as well as the more experienced diver. Within the sand, there are several rocky outcrops. 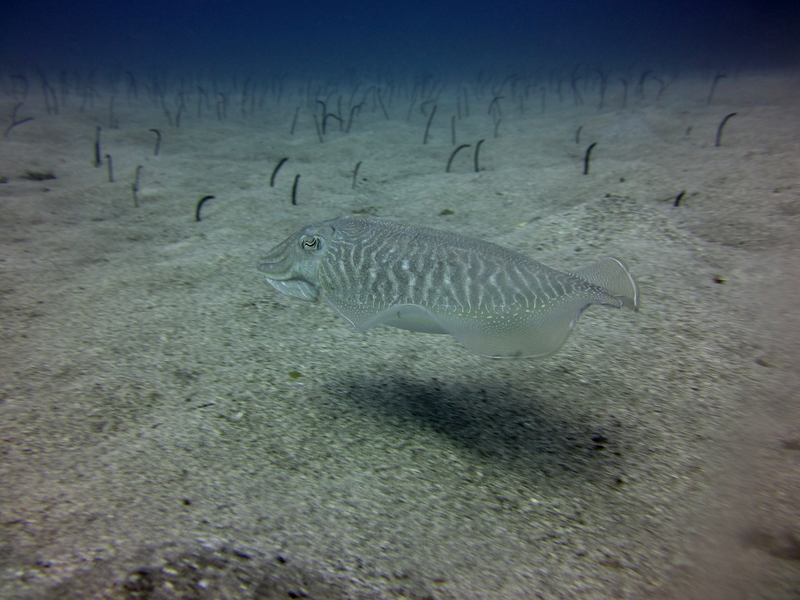 There can be found Black Sea Hare’s, Wide-eyed Flounders, Atlantic Damselfish, Sharpnose Puffers and Blue-fin Damsel fish. Fantastic easy to use camera with manual white balance great for all kinds of photography, with a fantastic Ikelite housing. We have two of these cameras that we both use on all our dives, we get great photographs, and video with this simple to use camera. The Cannon IXUS 115hs has 12 megapixels, 4 x optical zoom with a 3 inch screen and full HD movies. Having had cannon cameras before I found the menu really easy to navigate both for changing modes, viewing pictures and videos and downloading them. Ikelite ULTRAcompact digital underwater housing really delivers when performance and durability matter. The ULTRAcompact housing is high quality, built to last and backed by Ikelite’s long-standing reputation for excellence. 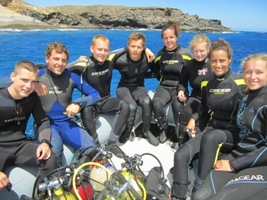 Already an Adventure or Advanced diver and thinking of continuing your diving education and training? 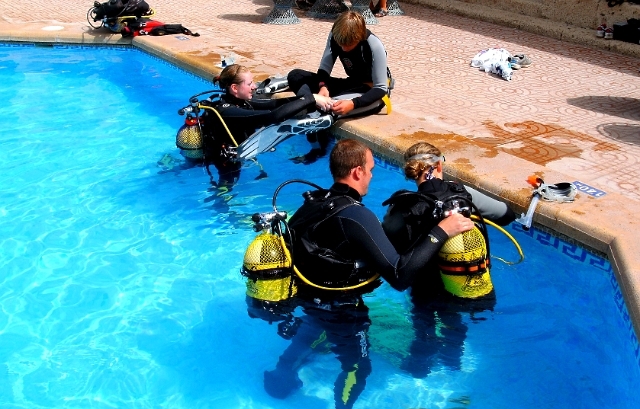 why not look at taking the rescue diver course. You must be a minimum of 12 years old and hold a current first aid certificate. If you do not have a current first aid certificate we can provide you with Emergency First Response training. 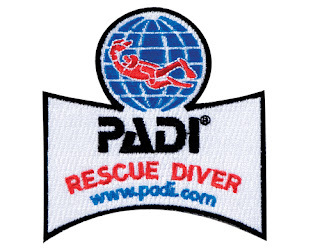 So what are the benefits of qualifying as a PADI Rescue diver? 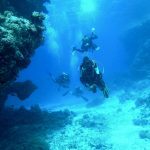 The most important benefit that I would promote as the number one reason why any diver every diver should train to become a PADI Rescue Diver, is that the course teaches you how to react in an emergency situation, whether it’s a tired diver, a panicked diver or a life threatening situation. The most important skill you are taught is how to keep yourself out of harms way whilst still providing assistance to your fellow divers. As with all PADI courses there is a theory side, you need to read the manual, complete the review sections and sit a multiple choice exam. 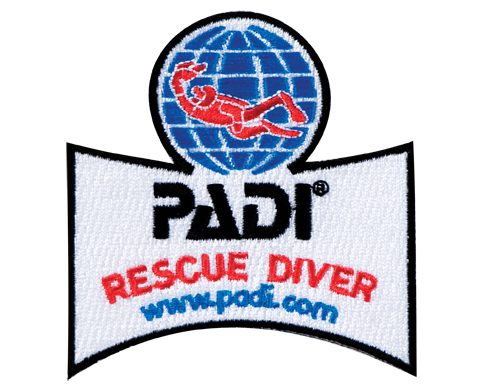 Once the theory is completed you move onto the practical training, The PADI Rescue diver course can be completed in two days and involves open water based training. We are now running our 6 or 8 week internship from the 1st of every calendar month, the next start date available is 1st May 2012. Upon arriving at my new home for the next 8 weeks (Dive and Sea Tenerife), my buddy Nate and I were greeted at the shop by Buzz and were given our new names. Now known as Steve, and Nate as Alan, we were given a tour of the beautiful diving facilities, shown our new ride, and taken to our big apartment. 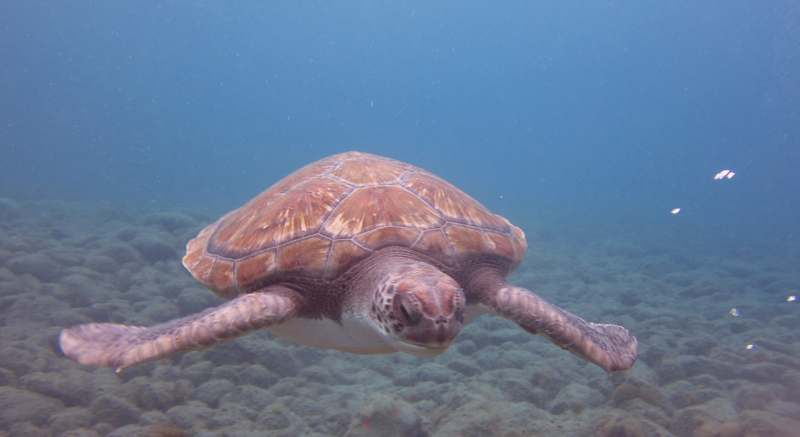 Things kicked off the next day when we took our first dive trip to El Puertito where the sun was shining, the water was clear, and I met my first Sea turtle! I was amazed at how comfortable these massive sea turtles were with the divers in the water, they came right up close to investigate because they have very poor vision. Things were even more amazing the next day when we were given the opportunity to dive our first deep water ship wreck! At Tabaiba, I dove deeper than I’ve ever gone – 30 metres! We were lucky enough to have great visibility and I recorded the dive with my first Go Pro video. I can honestly say that things have turned out better than I could have ever asked for so far on this trip. I would recommend to anyone who enjoys the underwater to take a trip and dive with the friendly staff here at Dive and Sea Tenerife.